I had the good fortune of meeting Professor Arthur Cohen at Karate College back in 2002. I attended his Control Points seminar and was very impressed. Professor Cohen is a rare breed; on one hand a great innovator in martial arts while on the other hand the embodiment of an ancient master. The last thing Professor Cohen wants to be called is a master, so I will honor that request, but he is most definitely a martial arts leader. Over the years of training with him, my respect for him as a martial artist and as a person have deepened. His generosity of spirit, his sense of honor, and humility, combined with his thirst for knowledge and wisdom combine to form the ideal mentor. He takes us well beyond the physical and delves into the psychology of self defense, human behavior and street behavior. A perennial student he is always analyzing what actually goes on in the street; trends in crime, gang behavior. While a traditional self defense instructor might teach a classic knife defense for years, Cohen will say, "Today the gang members might have Vaseline on their arms so that block will just slide off or they might be wearing spikes so your block will only cause you to get stabbed." His techniques are most practical for the street, they are indeed streetwise and very effective. Some of his techniques are so amazing that they come across almost as tricks. Combine his streetwise techniques, his professor style analysis of human behavior and the sociology of crime, his towering personality and you have the ultimate martial arts instructor. 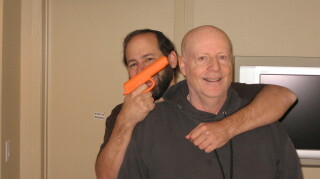 Moshe and Mr. Cohen, training can be fun, and effective. I have also had the privilege of conducting a seminar with Professor Cohen and learning from his constructive comments; always introduce yourself - people want to know why they should be listening to you, add humor - it helps break the ice, as well as many other important teaching tips.